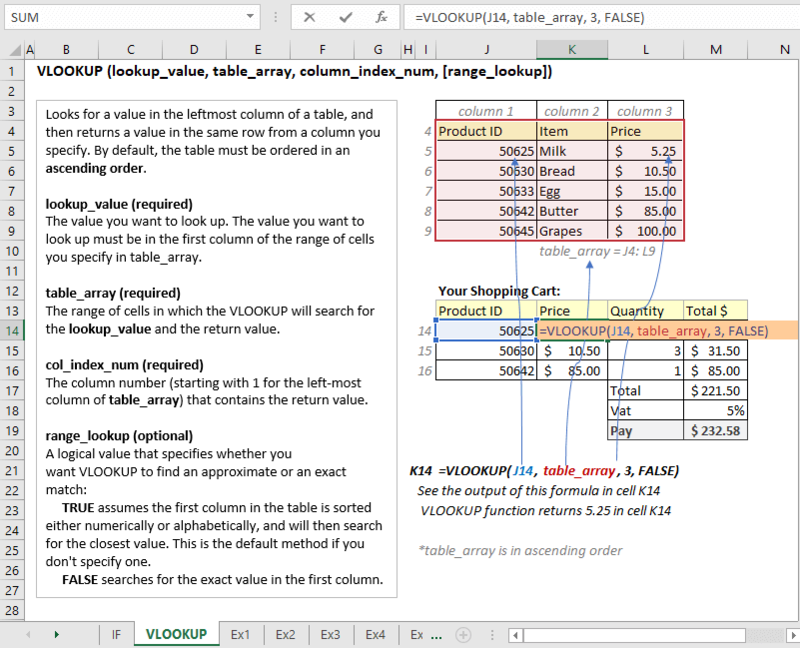 VLOOKUP is one of the most powerful and top used functions in Excel. Using IF logical function with VLOOKUP makes the formulas more powerful. 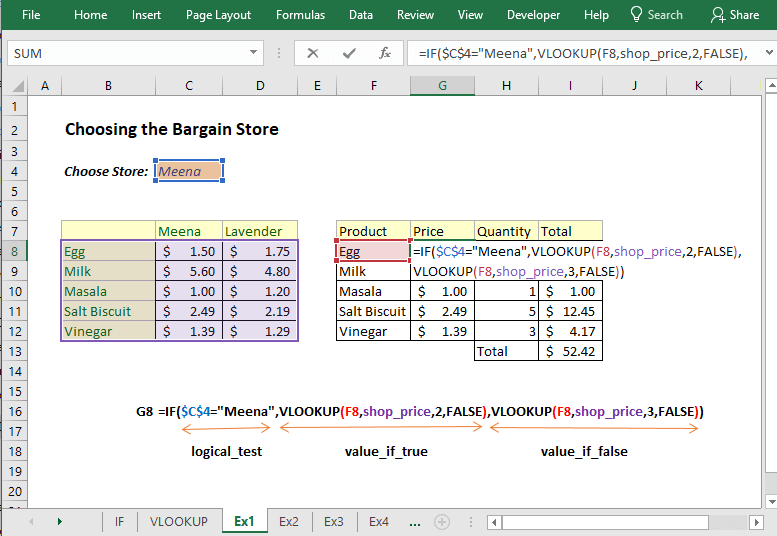 In this article, we shall see a good number of examples where we have paired VLOOKUP with IF condition in Excel. 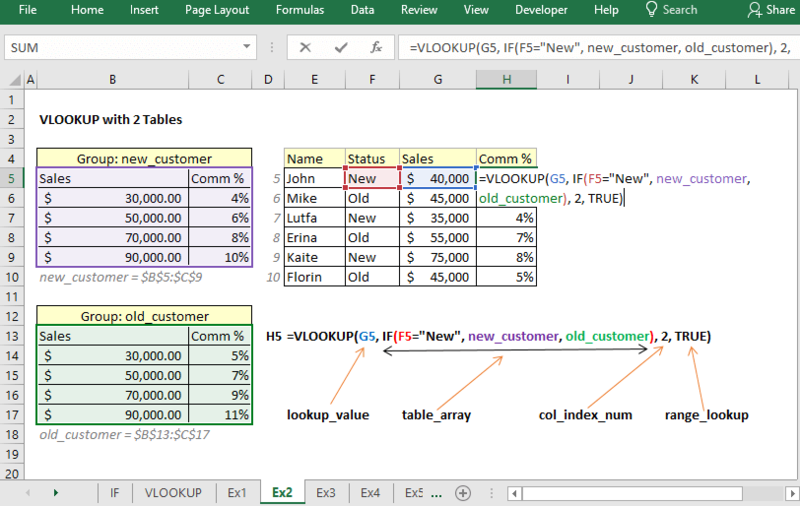 At first, let’s take a closer look at both the Excel IF and VLOOKUP functions. This will make it easy to understand the formulas. IF Function tests whether $C$4 cell value is equal to value Meena. If the above logical test is TRUE, it returns this part of the formula VLOOKUP(F8,shop_price,2,FALSE). It is a straightforward VLOOKUP formula. It searches for the value of cell F8 in the shop_price table array and if it finds there then returns the value of the 2nd column of the same row. 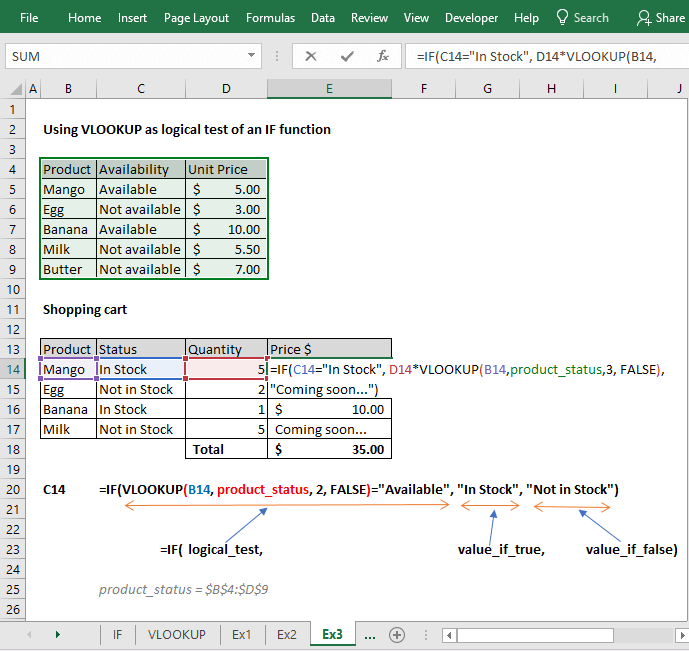 If the logical test is FALSE, then it returns this part of the formula VLOOKUP(F8,shop_price,3,FALSE). A simple VLOOKUP formula. VLOOKUP finds the value of the F8 cell in the shop_price table array and if it finds then returns the value of the 3rd column of the same row. In this example, you will see how to use two or more table arrays in Excel VLOOKUP formula. In the following image, you’re seeing how I have made a formula using VLOOKUP and IF functions to choose one of the two table arrays. G5 is the lookup_value here and it is an amount under the Sales column. IF(F5="New", new_customer, old_customer): This formula will return one of the two tables: new_customer and old_customer. new_customer = $B$5:$C$9 and old_customer = $B$13:$C$17. The rest is simple. Column index number is 2. So, the VLOOKUP function will return value from the 2nd column of the same row where it finds the lookup value. 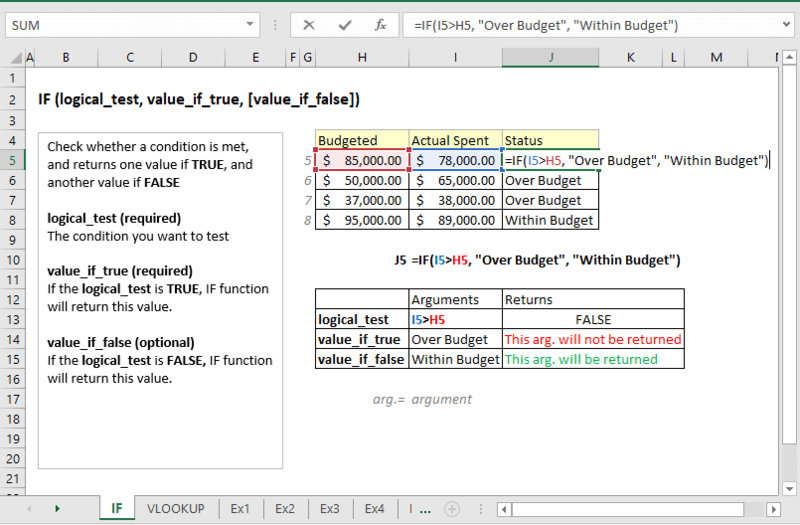 I have used TRUE value as the range_lookup argument, so the VLOOKUP function will search for the closest value equal to or less than the lookup value. This is a good example if you manage inventory using Excel. In the following worksheet (top left corner), you’re seeing I have a table. The table lists some products and their status under the Availability column. Let’s explain the logical_test argument of this formula. 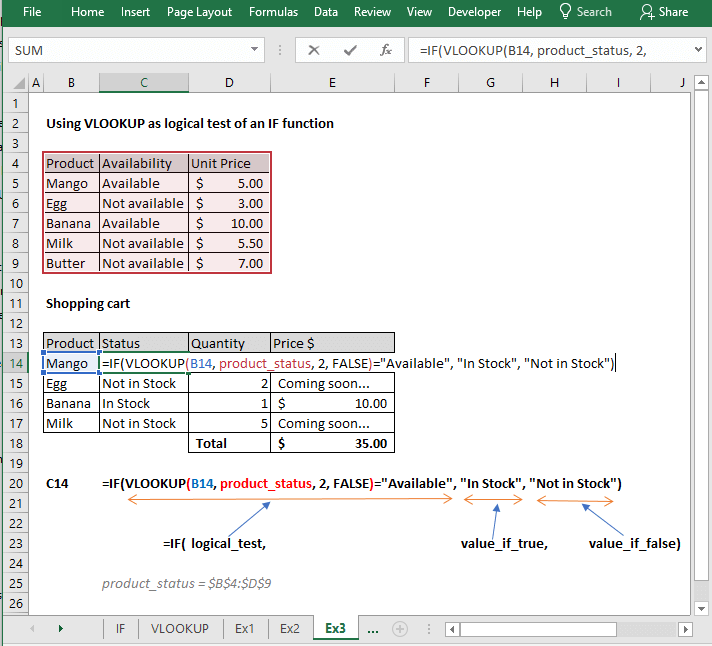 We are using this formula VLOOKUP(B14, product_status, 2, FALSE)="Available"as the IF function’s logical_test argument. If this part of the formula returns TRUE value then the cell will show “In Stock” value, otherwise it will show “Not in Stock” value. We have also used another IF and VLOOKUP combo under the Price $ column. If the value of cell C14 is “In Stock”, then the cell will show the value of this part of the formula: D14*VLOOKUP(B14,product_status,3, FALSE). This formula is just a product of D14 cell value and a simple VLOOKUP formula. If the value of cell C14 is not “In Stock”, then the cell will show this value “Coming soon…”. Look at the following image. You see when I select Projected, it is selecting the values under the Projected column of the first table (on the top left corner of the worksheet). When I am selecting the Actual Sales value, the table below is showing the values of Actual Sales column from the first table. This technique will help you a lot when you will make dashboards using Excel. In cell C14, I have made a data validation to show only two values: Projected and Actual Sales. Then in cell D16, I have used this formula =VLOOKUP(B16, sales_table, IF($C$14="Projected", 3, 4), FALSE). Then dragged down this formula for other cells in the same column. This is a straightforward simple VLOOKUP formula. We have just made the col_index_num argument part dynamic using an IF function. This part of the formula demands a little discussion: IF($C$14="Projected", 3, 4). If $C$14 value is equal to value Projected, the IF function will return 3, otherwise, it will return 4. 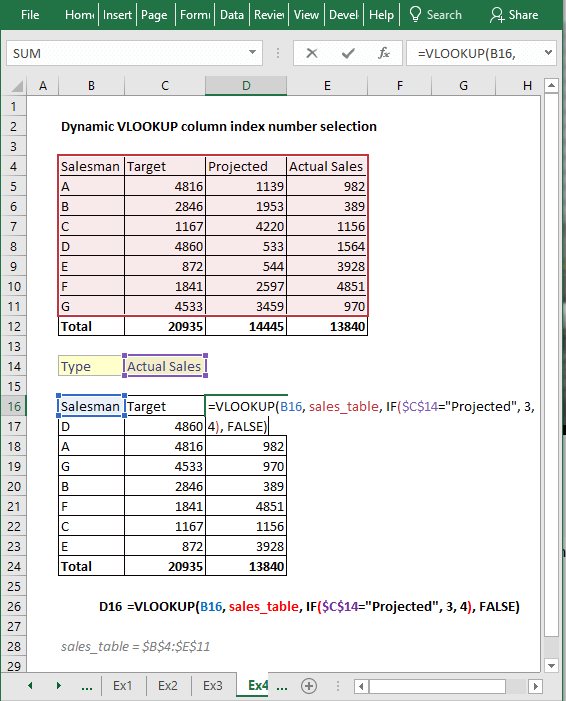 So, this is dynamically selecting the column index number of VLOOKUP formula. Quite interesting! These two techniques will help you to handle #N/A error. VLOOKUP generates #N/A error when it does not find a value that you’re looking for. Look at the following image intensively. Cell F6 shows the #N/A error as we did not handle the error smartly. But cell F7 and F8 does not show any error though VLOOKUP did not find the Noodles product in the leftmost table (our table_array). In cell F7, we have this formula: =IFERROR(VLOOKUP(E7,price_list,2,FALSE),"Not found"). As the value of IFERROR function, we have input the VLOOKUP formula. If this VLOOKUP formula returns an error, then “Not found” value will be shown in the F7 cell. Let’s explain the formula of cell F8. We have used this formula in cell F8: =IF(ISNA(VLOOKUP(E8,price_list,2,FALSE)), "Not found", VLOOKUP(E8, price_list, 2, FALSE)). 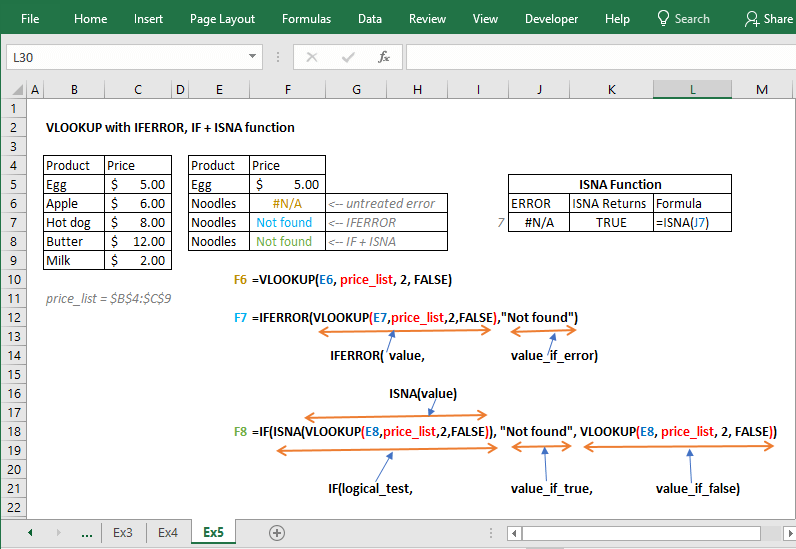 ISNA function returns TRUE when it finds the #N/A error. I have shown it on the top right corner of the worksheet. As the ISNA function’s value, I have input the VLOOKUP formula: VLOOKUP(E8,price_list,2,FALSE). If this formula returns the #N/A error, then ISNA will return a TRUE value and IF function’s logical_test argument will be TRUE. If this VLOOKUP formula returns a real value, ISNA will return a FALSE value. So, if ISNA returns the TRUE value, IF function’s this value “Not found” will be shown in the cell F8. Otherwise, this formula will be executed: VLOOKUP(E8, price_list, 2, FALSE). This is a straightforward VLOOKUP formula. So, these are my ways to use VLOOKUP with IF condition in Excel. I have shown total 5 examples. Do you know any other ways? If you want to add your technique to this article (with credit), please let me know in the comment box. I will update this article. By the way, great job!! Keep going! Yes. INDEX and MATCH combo work in a more versatile way than the VLOOKUP function. I did not use Index Match because I wanted to show all the examples with VLOOKUP and IF Functions.